Living in a state where medical marijuana is legal is a blessing for those of us who need the therapeutic relief of cannabis for chronic back pain. While CBD is easy to buy online and great as a daily supplement to keep inflammation down, the THC concentrate I need to relieve stabbing pain when my back goes out requires a trip to the dispensary and a current, state-issued medical card. Since I first received my state-issued medical marijuana card a couple of years ago, I have only needed to use it on a few occasions. The reminder to renew it arrived with plenty of time to make an appointment, so it didn’t seem like an immediate priority at the time. With my busy schedule, it’s difficult to set aside time. As weeks passed with no let-up in my schedule, the impending deadline slipped my mind. It wasn’t until the next time my back pain flared up that I became acutely aware that my medical card had long-since expired. Having severe back pain but no way of getting into a dispensary to pick up the medicine I needed was a reminder of how lucky we are to have access to medical marijuana. Despite the pain I was in, I just didn’t have time in the immediate future to go through the process, so I decided to just grin and bear it and I set off for an event. I later called the Mesa location to set up an appointment and was relieved to be able to get in on the same day. I arrived a few minutes early and, since waiting in doctors’ offices isn’t usually enjoyable, I decided to bide time in the parking lot. Moments after I arrived, I wound up meeting a veteran who had just left the clinic. When I asked how she liked Sun Valley, she happily volunteered to tell me how much she appreciated the care and advice she received from the doctors. She also mentioned that she received a discount because she is a veteran. I was impressed. Whenever given a choice about where I spend my money, I prefer to do so with a company that gives back to the community – especially when they support our veterans. I took it as a sign I was in the right place. Not sure what to expect on my first visit to Sun Valley, I was pleasantly surprised by the relaxing atmosphere. The waiting room was filled with meditative music as a sound track to whales featured on a flat screen TV. The receptionist who greeted me was friendly and professional. After completing a medical history questionnaire, she immediately sent me back to meet the first doctor. The doctor’s examination was more comprehensive than I expected. He asked a lot of questions, stretched me out on a chiropractic table to examine my lower back and then had me stand and do several different postures so he could determine how severe my pain was. When he was finished, I was taken to another room to see a second doctor, a cannabis expert qualified by the state to certify my eligibility for a medical card. After giving me another once-over exam, she took my vital signs and asked if I had any questions about medicating with cannabis. While I’m fairly knowledgeable about what works for me, I proceeded to ask her several questions about how and why cannabis will work on pain. More than any other certification physician I had met with before, she seemed very well-educated about the endocannabinoid receptors in my body, how they interact with the medicine to relieve pain and inflammation. Once she was satisfied that I had no more questions, she walked me into the last office where an administrator was waiting with my paperwork. He had already entered my information into the state’s online application portal and asked me to verify that it was correct before he submitted it. After my payment was accepted and my paperwork was processed, he explained details about using the card and when to expect it, and then gave me a booklet with referral cards and discounts at several recommended dispensaries. The entire process was professional and efficiently streamlined, and I really appreciated the thoroughness and knowledge of both physicians who examined me. I also appreciated the amount of time I saved by having both the diagnostic evaluation and medical certification in just one visit, at one place. In my position at The Cannabis Reporter, I am often asked for recommendations. With the reputation of our publication to protect, I take the requests very seriously and don’t make any recommendations I can’t honestly stand behind. 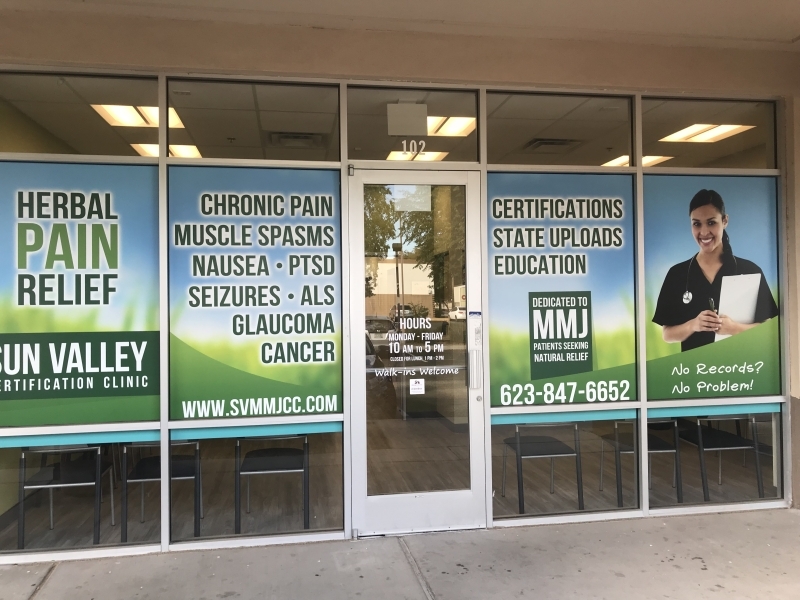 That said, after my experience with the doctors and staff at Sun Valley, I’d be happy to recommend them to anyone who asks me where to go for a medical marijuana certification. No doubt I’ll be back when it comes time to have my card renewed next year!